The Nokia 8110 Reloaded will be priced at €79 and will start shipping in May this year. Every year, phone companies make a beeline for Barcelona to showcase the very latest smartphone tech, at the annual Mobile World Congress (MWC) event. This year is no different, but it is HMD Global that has pulled a rabbit out of the hat—a feature phone meant for the smartphone age. Remember the Nokia 8110 phone from the 1999 sci-fi classic movie, The Matrix? That phone is back, as the new Nokia 8110 Reloaded. This is perhaps inspired by the 2017 effort of the returning Nokia 3310 feature phone, which stole the show back then. This phone, from almost 20 years ago, is now completely up to date, with 4G connectivity, a 2.4-inch colour display that runs the same software as the Nokia 3310, complete with an App Store and the Facebook app, for instance and 4GB internal storage. Thus runs the Qualcomm 205 processor, with 512MB RAM and has a 1,500mAh battery that will last for weeks on end. For those who find it important, this also has a 3.5mm headphone jack. 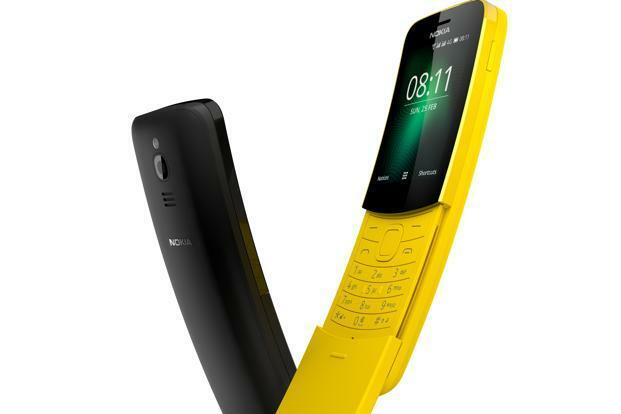 The banana-esque design has been retained, though the phone is now significantly smaller than its original avatar and the external antenna has been eliminated to keep in tune with the times. If classics are something that catch your fancy, this could be a phone to buy. But HMD Global isn’t stuck in the past however, and as expected, the successor to the Nokia 8 flagship phone has been unveiled as well. It is called the Nokia 8 Sirocco, and its looks beautiful. For starters, it has bezels significantly slimmer than the Nokia 8, which brings it more in line with its direct Android flagship smartphone competition. The 5.5-inch OLED display has a glass that curves gently around the sides to meet the metal frame. Inside is a Qualcomm Snapdragon 835 processor with 6GB RAM and 128GB storage. There is wireless charging too, and dual cameras (12-megapixel plus a 13-megapixel telephoto) too. There is a 3,260mAh battery and the Nokia 8 Sirocco is expected to run Android Oreo—the Android One version which is a clean version of the software with no tweaks or modifications. This will sport a price tag of €749 (around Rs60,000) though the India specific pricing and availability is still not confirmed. The other phones also unveiled are the Nokia 7 Plus (priced at €399) with a 6-inch IPS display, single block aluminum finish, dual 12-megapixel cameras which HMD Global says are a new system altogether, runs the Qualcomm Snapdragon 660 processor with 4GB RAM. This will be a strong contender for the mid-range Android smartphone space, but as with the Nokia 8 Sirocco, this will also have to be priced right in India.